The lithospheric plates are the sections of Earth's crust and upper mantle that move—very slowly—over the lower mantle below. We know that these plates move from two different lines of evidence—geodetic and geologic—which allow us to trace their movements back in geologic time. Geodesy, the science of measuring the Earth's shape and positions on it, allows us to measure plate motion directly using GPS, the Global Positioning System. This network of satellites is more stable than the Earth's surface, so when a whole continent moves somewhere at a few centimeters per year, GPS can tell. The longer we record this information, the more accurate it becomes, and in much of the world, the numbers are already quite precise. Another thing GPS can show us is tectonic movements within plates. One assumption behind plate tectonics is that the lithosphere is rigid, and indeed that is still a sound and useful assumption. But parts of the plates are soft in comparison, like the Tibetan Plateau and the western American mountain belts. GPS data helps us separate blocks that move independently, even if only by a few millimeters per year. In the United States, the Sierra Nevada and Baja California micro-plates have been distinguished this way. Three different geologic methods help determine the trajectories of plates: paleomagnetic, geometric, and seismic. The paleomagnetic method is based on the Earth's magnetic field. In every volcanic eruption, iron-bearing minerals (mostly magnetite) become magnetized by the prevailing field as they cool. The direction in which they're magnetized points to the nearest magnetic pole. Because oceanic lithosphere forms continuously by volcanism at spreading ridges, the whole oceanic plate bears a consistent magnetic signature. When the Earth's magnetic field reverses direction, as it does for reasons not fully understood, the new rock takes on the reversed signature. Thus most of the seafloor has a striped pattern of magnetizations as if it were a piece of paper emerging from a fax machine (only it's symmetrical across the spreading center). The differences in magnetization are slight, but sensitive magnetometers on ships and aircraft can detect them. The most recent magnetic-field reversal was 781,000 years ago, so mapping that reversal gives us a good idea of plate movements in the most recent geologic past. The geometric method gives us the spreading direction to go with the spreading speed. It's based on the transform faults along the mid-ocean ridges. If you look at a spreading ridge on a map, it has a stair-step pattern of segments at right angles. If the spreading segments are the treads, the transforms are the risers that connect them. Carefully measured, these transforms reveal directions of spread. With plate speeds and directions, we have velocities that can be plugged into equations. These velocities match the GPS measurements nicely. Seismic methods use the focal mechanisms of earthquakes to detect the orientation of faults. Although less accurate than paleomagnetic mapping and geometry, these methods are useful for measuring plate movements in parts of the globe that aren't well mapped and have fewer GPS stations. We can extend measurements into the geologic past in several ways. The simplest one is to extend paleomagnetic maps of the oceanic plates out from the spreading centers. Magnetic maps of the seafloor translate precisely into age maps. These maps also reveal how the plates changed velocity as collisions jostled them into rearrangements. Unfortunately, the seafloor is relatively young, no more than about 200 million years old, because it eventually disappears beneath other plates by subduction. As we look deeper into the past, we must rely more and more on paleomagnetism in continental rocks. 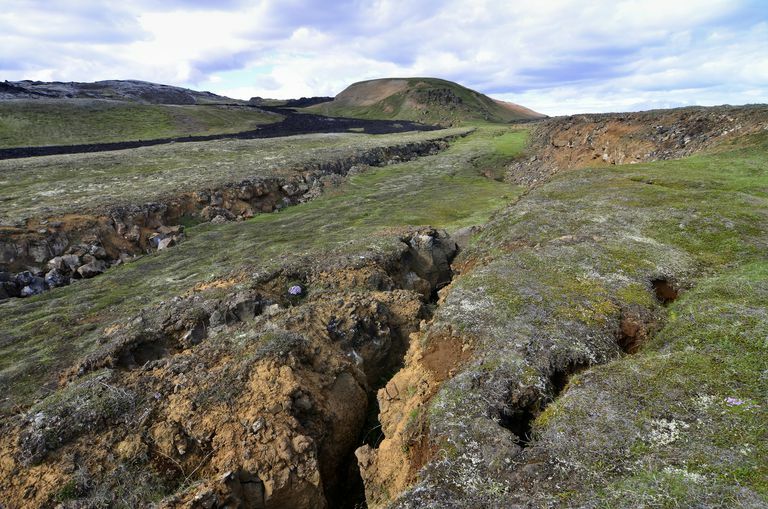 As plate movements have rotated the continents, the ancient rocks have turned with them, and where their minerals once indicated north, they now point somewhere else, toward "apparent poles." When you plot these apparent poles on a map, they appear to wander away from true north as rock ages go back in time. In fact, north does not change (usually), and the wandering paleo-poles tell a story of wandering continents. Together, the methods listed above allow us to produce an integrated timeline of the movement of the lithospheric plates, a tectonic travelogue that leads smoothly up to the present. What Are Convergent Plate Boundaries? Do You Know How Observers Measure Precipitation? What Is the Cause of the Earth’s Reversal of Its Magnetic Poles?